If you are looking for a spacious vehicle that can comfortably accommodate up to 52 to 53 persons, you need not look any further. We are offering our services to safely and securely transport you and your group to any points here in Cebu City as well as anywhere in the island of Cebu. Please be reminded, should you want to go to The Tops in Cebu , Cebu Zipline at Doce Pares, or Mr. A Restaurant this type of vehicle is NOT permitted by Land Transportation Office (LTO) and Department of Tourism (DOT) to travel up the steep mountains and routes common to these places. This is to prevent any untoward incident of road mishap and other unforseen circumstances that may put danger to you as a passenger and thus delay your tour. Kindly advise us as early as possible should you want to cancel your reservation and request for a full refund of reservation fee payment. But please be reminded that cancellation made within less than 3 days (or 72 hours) will not be availed of any refund. To avoid such cases please have your tour service confirmed at least five (5) days before start of tour date. If you have any other itineraries where you would like to go here in Cebu, please feel free to discuss it with us so we can make the proper adjustment on your tour schedule and any other changes in tour package rates and fees, where applicable. If you are looking for a spacious vehicle that can comfortably accommodate up to 22 to 23 persons, you need not look any further. We are offering our services to safely and securely transport you and your group to any points here in Cebu City as well as anywhere in the island of Cebu. If you are looking for a spacious vehicle that can comfortably accommodate up to 12 to 13 persons, you need not look any further. We are offering our services to safely and securely transport you and your group to any points here in Cebu City as well as anywhere in the island of Cebu. Please be reminded, should you want to go to The Tops in Cebu , Cebu Zipline at Doce Pares, or Mr. A Restaurant there will be an additional fee of PHP500 because it will be a "special trip" going to the mountainous and steep route. One-way travel time would take ~20-30 minutes from Cebu City outskirts. But if the number of passengers in the tour group would be more than six (6) persons, we will NOT allow our vehicle to travel to these routes because this will be considered as overloaded and will put excessive pressure to the engine and tires that may later on result to irreparable damage and not to mention the difficulty in maneuvering up hill with having too much passenger load. If you are looking for a spacious vehicle that can comfortably accommodate up to 10 to 11 persons, you need not look any further. 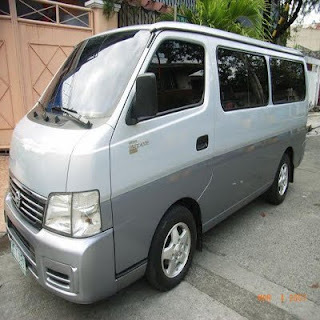 We are offering our services to safely and securely transport you and your group to any points here in Cebu City as well as anywhere in the island of Cebu.